Sometimes you come across something on the Internet that is so overwhelmingly kewl just on the basis of the obvious amount of passion and intelligence poured into it, that you can't wait to praise the effort and share it with others. That's what I felt after finding Lockjaw, The World's Greatest Superhero. It's a very detailed site that, with great affection and eloquence, argues why Lockjaw of the Inhumans from the Marvel Universe is the best comic book character around. 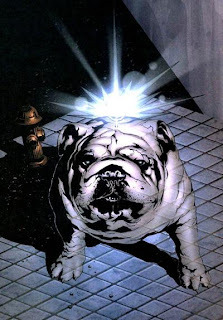 In terms of innocence, nobility, and utter power, this Terrigen Mist-altered bulldog lives a life of romp, play, and the occasional rescuing of the universe on his own terms. Not even Galactus comes close to matching Lockjaw's unrestrained abilities, the author insists.